PORTLAND, OR--(Marketwired - July 14, 2016) - Bulk Bookstore, the leading online wholesaler of books in bulk, has been successfully offering book-loving educators a chance to win $100 in free books for the classroom as part of their The Big K-12 Educators Book Giveaway. Designed exclusively for school administrators, librarians and teachers, the monthly giveaway is simple to enter through www.bulkbookstore.com. Now entering its fifth month, past contest winners have come from Shafer Middle School in Nashville, Tenn., Towanda Elementary School in Towanda, Kan., Acelero Learning in Milwaukee, Wis. and Forney High School in Forney, Texas. A different educator is selected at random every month based on all eligible entries. Winners are provided with a unique $100 promotion code to select and order books based on their school or classroom needs. No purchase is necessary however only one entry per person per month is accepted. 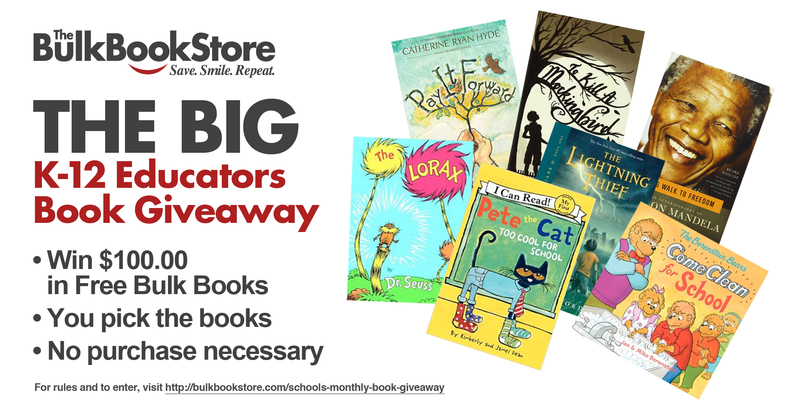 Since Bulk Bookstore created the giveaway to show appreciation for schools, librarians, and teachers, winners must have a school mailing address and be presently employed at that school or school district. Bulk Bookstore is home to an online catalog that features more than half a million currently published book titles, including a wide selection of children's and classroom literature selections perfect for the K-12 learning. "We're thrilled with the early response of the giveaway," said Reagan Cooper, Educational Specialist for Bulk Bookstore. "It's rewarding to see educators from across the country jumping at the chance to enroll in The BIG K-12 Educators Book Giveaway. We expect this momentum to continue as we approach the start of the new school year." Visit www.bulkbookstore.com/schools-monthly-book-giveaway for more information about The Big K-12 Educators Book Giveaway or contact a Bulk Bookstore Book Specialist at 877-855-5956. Founded in 2007, Bulk Bookstore is headquartered in Portland, Oregon. Bulk Bookstore is the book industry's leading online bulk wholesaler that specializes in selling 25 copies or more of 3 million currently published titles. Different from other online retailers and traditional book stores who are efficient sellers of individual copies of books, Bulk Bookstore specializes in discounting and delivering multiple, bulk copies. For more information, please visit www.bulkbookstore.com or call 877-855-5956 to speak to a Bulk Bookstore Book Specialist. Bulk Bookstore has introduced their biggest book giveaway ever called The Big K-12 Educators Book Giveaway. Designed exclusively for school administrators, librarians and teachers, the monthly giveaway provides educators from across the country the opportunity to win $100 in free bulk books for classrooms at www.bulkbookstore.com.